Last Year: 9th with a 11-13 (-33) record and 26 points. How much time does Steve Price get to turn the Dragons into a contender? While they finished 9th last year, they didn't play like a team that only just missed the playoffs - and that's why there is a lot of pressure on the 2nd year coach to deliver more than just a playoff spot. Tough crowd. Gerard Beale has been given the keys to the fullback job and is going to show he's can play like former Dragon Darius Boyd if he is to avoid a grilling early. He's got his chance to be a #1 - now we get to see what kind of fullback he really is. Josh Drinkwater could be the answer at halfback but he might also be nothing more than a NYC highlights machine. Tyson Frizell and Bronson Harrison add something to the backrow - with Frizell fancied as the biggest contributor by getting the start. Leeson AH MAU, Damien COOK, Evander CUMMINS, Bronx GOODWIN, Nathan GREEN, Michael HENDERSON, Cameron KING, Will MATTHEWS, Blake PHILLIPS, Adam QUINLAN, Todd RYAN, Kem SERU, Chase STANLEY, Kyle STANLEY, Jack STOCKWELL, Atelea VEA, Shannon WAKEMAN. Unless Rein is ruled out of Round 1 - Fien will be the starting halfback, with Drinkwater forced to fight it out for a spot on the bench with King. Prior or Weyman will start at prop, while Merrin looks set to be the lock. Harrison faces stiff competition from youngster Stockwell for a spot on the bench. STI: Beale, Morris, Cooper, Vidot, Nightingale, Soward, Fien, Hunt, Rein, Prior, Creagh, Frizell, Merrin. Bench: King/Drinkwater, Weyman, Harrison, de Belin/Henderson. Josh Drinkwater has the hype but right now - he's got Fien standing in his way to live up to it. Is he a NYC flash in the pan or a legitimate NRL halfback? We won't know unless he gets a chance... Jack Stockwell might catch the eye if he gets an early run in first grade, while Evander Cummins and Nathan Green look like being next in line (if fit) for the backline. The other name to write down is Adam Quinlan - he tore up the NYC at the back end of last year and is a superb support player. Two games early in the season stand out - Round 2 in Wollongong v Brisbane on Friday March 15 and Round 5 at Kogarah against Wayne Bennett's Knights on Sunday April 7. 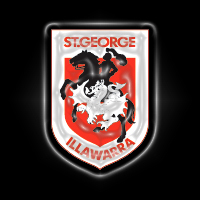 If St George Illawarra fans can't get out to both grounds in massive numbers for those matches - why bother showing up at all for the rest of 2013? Like most teams a good start is important, but the Dragons have a favourable run home with five of their last seven at Kogarah or WIN Stadium. But you need to be in a position to take advantage of that... the biggest element they need to address is giving their talented outside backs enough of the ball - which was hard work last year. 13th | There's some quality in this squad but part of the problem is it doesn't fire often enough. Rehashing last year's game plan and hoping for more simply won't get it done. 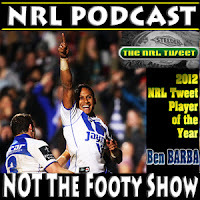 Can Brett Morris or Ben Creagh take Ben Barba's mantle as the game's best player in the 2013 @NRLTweet Player of the Year Awards?